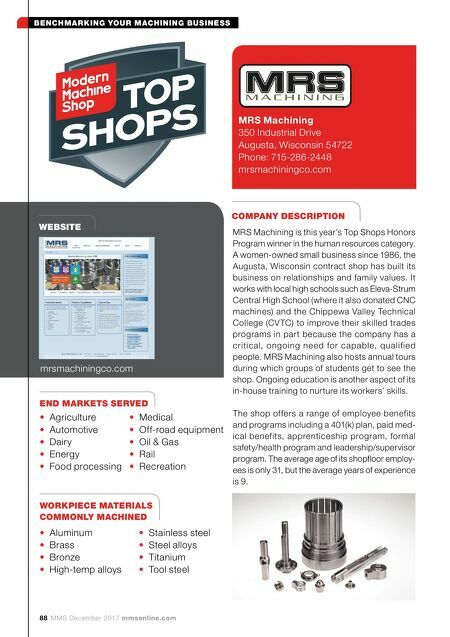 88 MMS December 2017 mmsonline.com BENCHMARKING YOUR MACHINING BUSINESS END MARKETS SERVED WEBSITE mrsmachiningco.com COMPANY DESCRIPTION WORKPIECE MATERIALS COMMONLY MACHINED • Agriculture • Medical • Automotive • Off-road equipment • Dairy • Oil & Gas • Energy • Rail • Food processing • Recreation • Aluminum • Stainless steel • Brass • Steel alloys • Bronze • Titanium • High-temp alloys • Tool steel MRS Machining 350 Industrial Drive Augusta, Wisconsin 54722 Phone: 715-286-2448 mrsmachiningco.com MRS Machining is this year's Top Shops Honors Program winner in the human resources category. A women-owned small business since 1986, the Augusta, Wisconsin contract shop has built its business on relationships and family values. It works with local high schools such as Eleva-Strum Central High School (where it also donated CNC machines) and the Chippewa Valley Technical College (CV TC) to improve their skilled trades programs in part because the company has a critical, ongoing need for capable, qualif ied people. 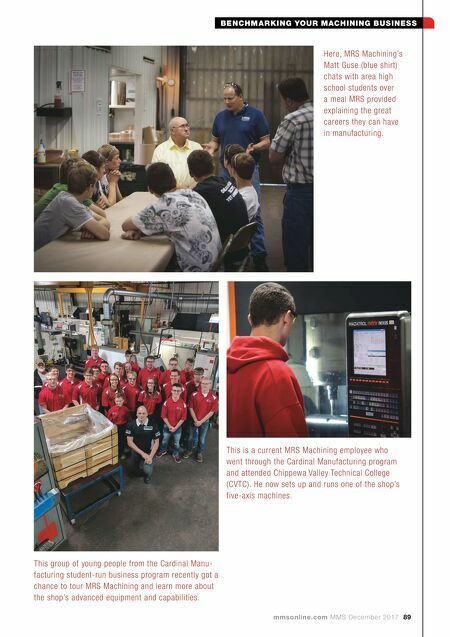 MRS Machining also hosts annual tours during which groups of students get to see the shop. Ongoing education is another aspect of its in-house training to nurture its workers' skills. The shop offers a range of employee benefits and programs including a 401(k) plan, paid med- ical benefits, apprenticeship program, formal safety/health program and leadership/supervisor program. The average age of its shopfloor employ- ees is only 31, but the average years of experience is 9.